Airless Paint Spray Gun approx. 10"-12" from siding. A good and proper airless spraying method is necessary to maintain consistency of the film thickness and achieve the best aesthetic results. This method is very easy to do with a little practice. Once you get used to spraying paint with an airless you will find yourself spraying everything! I’m sure you have noticed someone spraying with a back and forth motion, example- right to left and then left to right. This is a great airless spraying method that is easy to use. Another method is to spray up and down. That’s right you can spray right to left, or left to right, and up and down. 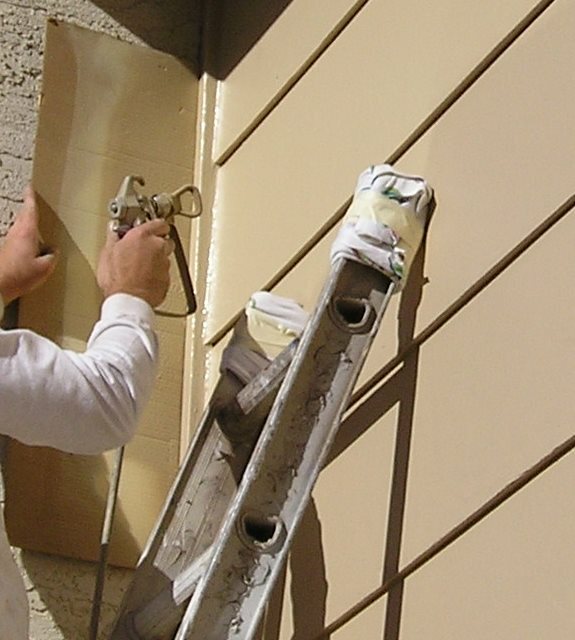 The vertical airless spraying method is very useful for spraying long walls or odd shaped surfaces, while the horizontal method is best for siding. Try both methods and see which one works best for your situation. One key point is always spray in a straight line. This is very simple; Keep the gun and tip at a right angle, perpendicular, to the surface being sprayed. This principle applies whether you are spraying horizontally or vertically. You simply turn the tip and housing. I have noticed that many sprayers’ use a loose method that shoots paint out at both ends of the spraying stroke. This sweeping motion causes a lot of overspray and wastes paint. 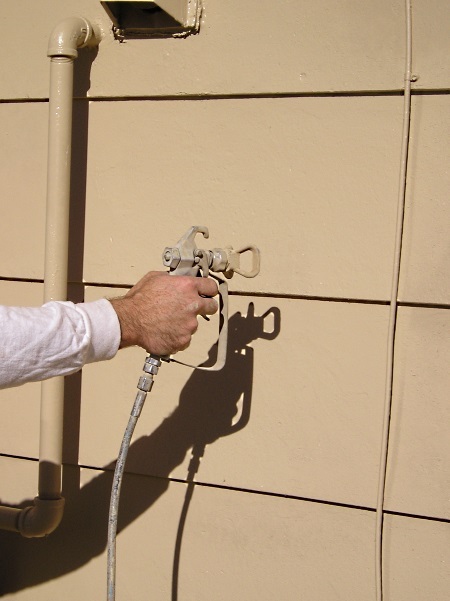 By learning to hold the spray gun at a right angle you can avoid much of this overspray. It isn’t always possible to spray at a perfect right angle. This is a general rule that is worth practicing. Every manufacture has a slightly different gun design but they all come down to two things, 2 finger trigger or 4 finger trigger. Choose the style that best suites you and feels comfortable. The spray gun needs to be a natural part or extension of your arm. The ability to spray well really demands this. The motion used and when to pull the trigger is also very important. When the trigger is pulled it is always fully open. Because of this you must be in motion before the trigger is pulled and release the trigger before the end of motion. This is the spray stroke. I recommend practicing before being gun-ho, you can use a large piece of cardboard. Another great way to practice is spraying a surface that will be back-rolled. All spray tips are rated for a certain width at 12 inches from the surface being sprayed. This distance is an industry standard for testing spray tips and is a good starting point. One foot from the surface will give the best coverage without a lot of sags. Holding 12 inches from the surface is tough, 16 inches from the surface is the maximum distance that is acceptable. Any farther will spread out the paint to far and cause more overspray. Try to maintain the same distance throughout spraying stroke. Varying this distance will change the width of the spray stroke. If you find yourself doing a lot of reaching and stretching try using a tip extension pole attached to the gun. Spray about a 3 foot long strip at a time. At the end of one spray stroke drop down and begin the next, overlapping about 1/2 of the width. This will ensure even coverage. As you practice the overlapping will become less. This also works for vertical spraying. 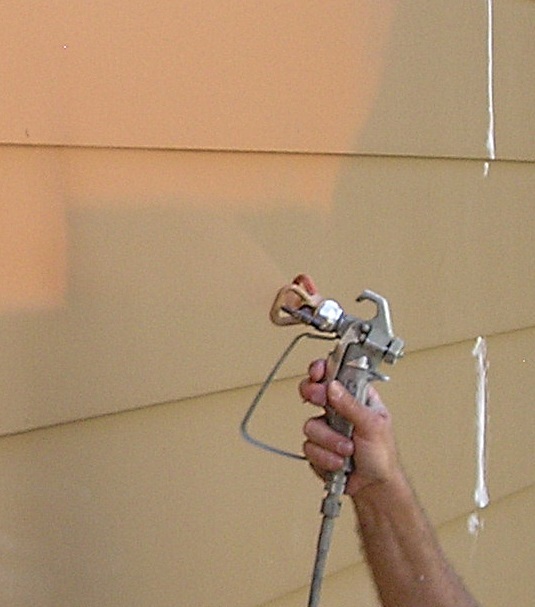 An example is spraying a long 8 foot tall wall with a 517 tip using the vertical spraying method; Begin at one corner and start at the top of the wall. Spray the stripe down the wall. At the bottom move over 6-8 inches and begin spraying, moving the gun up the wall. Each stroke will cover 6-8 inches. 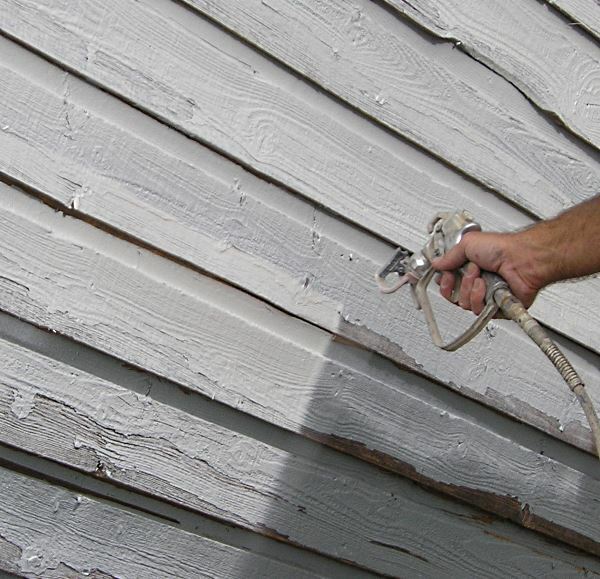 Although this is a great way to paint, using an airless sprayer does require constant movement and some stretching especially spraying an exterior. Plus it is a bit dangerous. Never point the gun at your self or someone else. The paint is under a lot of pressure and it can be injected under the skin. This is a dangerous injury that requires immediate medical attention. Make sure you are physically fit for this type of work. Practice using an airless spraying method that will work for you and the type of surface you are spraying before starting a large job.